Second-half strikes from Chris Eagles and Gael Kakuta sent Bolton into the fourth round of the Carling Cup as they comfortably beat Aston Villa. Eagles found the net from 20 yards via a slight deflection off Villa defender James Collins after Marc Albrighton had given away possession. Gabriel Agbonlahor had Villa's best chance but his tame header went wide. 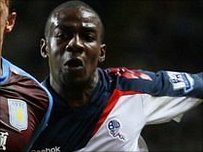 Debutant Kakuta doubled Bolton's lead with a drilled shot from the edge of the area after Villa failed to clear. Bolton had the better of the first half and were unlucky not to take the lead when Eagles's corner was met by centre-back David Wheater, whose header thudded against the outside of the post. Soon after Bolton keeper Adam Bogdan made a crucial near-post stop to block Agbonlahor's shot from Albrighton's dipping centre. But while the first half was tame, the second saw more action with Eagles giving Bolton the lead after taking advantage of the ball bouncing off Albrighton into his path and he hammered a powerful drive past Shay Given from 20 yards out for his first goal for the club. And with 12 minutes left Kakuta doubled Bolton's lead when he drilled Ricardo Gardner's floated free-kick into the box past Given. 90:00+3:54 The referee signals the end of the game. 90:00+1:27 Paul Robinson concedes a free kick for a foul on Nathan Delfouneso. Charles N'Zogbia takes the direct free kick. 89:45 Darren Pratley concedes a free kick for a foul on Alan Hutton. Shay Given restarts play with the free kick. 89:23 Short corner worked by Darren Pratley. 88:52 Barry Bannan concedes a free kick for a foul on Darren Pratley. Ricardo Gardner takes the direct free kick. 87:31 Substitution Mark Davies is brought on as a substitute for Fabrice Muamba. 86:29 James Collins takes a shot. Save by Adam Bogdan. 86:07 Kevin Davies is flagged offside by the assistant referee. Shay Given restarts play with the free kick. 85:38 Adam Bogdan takes the free kick. 85:38 Booking The referee shows Barry Bannan a yellow card. 85:31 Foul by Barry Bannan on Ricardo Gardner, free kick awarded. 83:47 Gael Kakuta fouled by Stiliyan Petrov, the ref awards a free kick. Free kick taken by Adam Bogdan. 83:18 Corner taken by Barry Bannan, Kevin Davies makes a clearance. 82:03 Richard Dunne gives away a free kick for an unfair challenge on Kevin Davies. Chris Eagles restarts play with the free kick. 79:14 Free kick awarded for a foul by Kevin Davies on Alan Hutton. Alan Hutton takes the free kick. 78:31 Nathan Delfouneso sends in a cross, Gary Cahill manages to make a clearance. 76:57 The assist for the goal came from Ricardo Gardner. 76:57 GOAL - Gael Kakuta:Aston Villa 0 - 2 Bolton Gael Kakuta finds the net with a goal from the edge of the area to the bottom right corner of the goal. Aston Villa 0-2 Bolton. 76:39 Barry Bannan is adjudged to have handled the ball. Ricardo Gardner takes the direct free kick. 75:55 Substitution Paul Robinson joins the action as a substitute, replacing Gretar Rafn Steinsson. 75:27 Barry Bannan produces a cross. 73:06 Outswinging corner taken left-footed by Barry Bannan, clearance made by Stuart Holden. 72:39 Substitution Charles N'Zogbia replaces Marc Albrighton. 72:39 Substitution Kevin Davies replaces David Ngog. 66:28 A cross is delivered by Marc Albrighton, clearance by Darren Pratley. 65:53 Free kick awarded for an unfair challenge on Nathan Delfouneso by Ricardo Gardner. Barry Bannan restarts play with the free kick. 63:39 Gary Cahill concedes a free kick for a foul on Gabriel Agbonlahor. Stiliyan Petrov restarts play with the free kick. 63:08 Gael Kakuta delivers the ball. 61:28 Marc Albrighton delivers the ball. 60:12 Darren Pratley fouled by Nathan Delfouneso, the ref awards a free kick. David Wheater takes the direct free kick. 59:50 Foul by Marc Albrighton on Gary Cahill, free kick awarded. Stuart Holden takes the direct free kick. 56:14 Corner taken by Gael Kakuta from the right by-line to the near post, Nathan Delfouneso manages to make a clearance. 56:05 Chris Eagles takes a shot. James Collins gets a block in. 53:46 GOAL - Chris Eagles:Aston Villa 0 - 1 Bolton A goal is scored by Chris Eagles from outside the penalty area to the top right corner of the goal. Aston Villa 0-1 Bolton. 50:08 The ball is swung over by Darren Pratley, James Collins manages to make a clearance. 49:21 Outswinging corner taken by Barry Bannan, Header from deep inside the area by Nathan Delfouneso goes harmlessly over the crossbar. 48:56 Corner taken by Barry Bannan from the left by-line to the near post, Gary Cahill makes a clearance. 48:00 Corner from the left by-line taken by Chris Eagles, Gary Cahill produces a header from close range which goes wide of the left-hand post. 46:59 Foul by Darren Pratley on Stiliyan Petrov, free kick awarded. Shay Given takes the direct free kick. 45:29 Unfair challenge on Marc Albrighton by Chris Eagles results in a free kick. Free kick taken by James Collins. 45:00+0:59 The first half comes to an end. 41:29 Corner taken by Marc Albrighton, clearance by David Wheater. 41:25 Alan Hutton produces a cross, David Wheater makes a clearance. 39:41 Centre by Marc Albrighton. 39:27 The ball is sent over by Marc Albrighton, clearance by Gretar Rafn Steinsson. 38:49 Free kick taken by Barry Bannan. 38:49 Booking The referee shows Gary Cahill a yellow card. 38:43 Unfair challenge on Stephen Ireland by Gary Cahill results in a free kick. 38:10 Ricardo Gardner gives away a free kick for an unfair challenge on Marc Albrighton. James Collins restarts play with the free kick. 36:56 Barry Bannan takes a shot. Gary Cahill gets a block in. 33:40 Corner from the right by-line taken by Chris Eagles, Headed effort from close in by David Wheater bounces off the post. 33:33 Centre by Chris Eagles, Richard Dunne manages to make a clearance. 31:22 David Wheater gives away a free kick for an unfair challenge on Gabriel Agbonlahor. Stiliyan Petrov restarts play with the free kick. 30:44 Barry Bannan has an effort at goal from just outside the box which goes wide of the right-hand post. 29:39 Fabrice Muamba challenges Richard Dunne unfairly and gives away a free kick. James Collins restarts play with the free kick. 27:10 The referee blows for offside against Nathan Delfouneso. Adam Bogdan takes the indirect free kick. 26:38 Chris Eagles produces a right-footed shot from long range which goes wide left of the goal. 24:06 Inswinging corner taken right-footed by Marc Albrighton from the right by-line. 23:36 Gabriel Agbonlahor takes a shot. Blocked by David Wheater. 22:46 Headed effort from inside the area by Gabriel Agbonlahor misses to the left of the goal. 21:28 Gabriel Agbonlahor challenges Chris Eagles unfairly and gives away a free kick. Chris Eagles crosses the ball in from the free kick. 20:19 Unfair challenge on Darren Pratley by Stiliyan Petrov results in a free kick. Adam Bogdan restarts play with the free kick. 19:55 Gael Kakuta concedes a free kick for a foul on Stiliyan Petrov. Free kick taken by Shay Given. 19:23 The assistant referee flags for offside against Darren Pratley. Shay Given restarts play with the free kick. 17:46 Nathan Delfouneso has an effort at goal from outside the penalty box which goes wide left of the goal. 15:24 Marc Albrighton concedes a free kick for a foul on Ricardo Gardner. Darren Pratley takes the free kick. 14:52 Gabriel Agbonlahor sends in a cross, Ricardo Gardner makes a clearance. 14:23 Gretar Rafn Steinsson produces a cross. 11:15 Outswinging corner taken from the right by-line by Chris Eagles, James Collins manages to make a clearance. 8:26 Fabrice Muamba concedes a free kick for a foul on Stiliyan Petrov. Richard Dunne takes the free kick. 7:30 Inswinging corner taken by Barry Bannan, save by Adam Bogdan. 6:39 Fabrice Muamba concedes a free kick for a foul on Nathan Delfouneso. Free kick crossed by Barry Bannan, clearance made by David Wheater. 5:21 David Ngog takes a shot. Shay Given makes a save. 4:59 Gael Kakuta takes a shot. Blocked by Stephen Warnock. 4:52 Chris Eagles sends in a cross, blocked by Stephen Warnock. 3:06 Outswinging corner taken right-footed by Chris Eagles from the right by-line to the near post, Stephen Ireland manages to make a clearance. 3:00 Centre by David Ngog. 0:31 Unfair challenge on Gael Kakuta by Stephen Warnock results in a free kick. Gretar Rafn Steinsson takes the free kick.